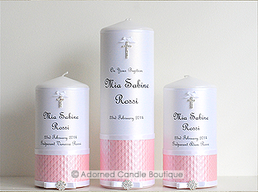 Adorned Candle Boutique presents 'Powder Pink'. 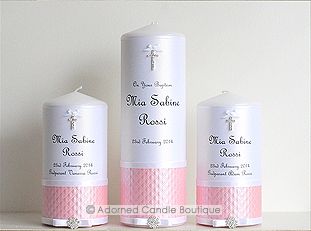 This lovely Baptism Candle is adorned in a pearl powder pink pattern and trimmed with three white satin ribbons. It is finished with two petite bows, a stunning diamante cross and a round clustered diamante embellishment. Your personalised details will be displayed in a French style script, set on a white pearl background. This set comes with two smaller family/godparent candles to match. Perfect for any occasion.